Posted on November 23, 2008 by Taneya Tagged Faulkner	CommentsNo Comments on The Librarian! 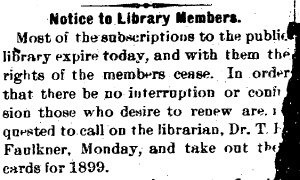 The librarian in me could not pass up blogging about this one – In the December 31, 1898 issue of the Kinston Free Press, there is a notice to all those who have subscriptions to the library to renew them. The article is partially torn, so there is not enough of it visible for me to really transcribe it, but it begins with the following paragraph and identifies Dr. T.H. Faulkner as the librarian.